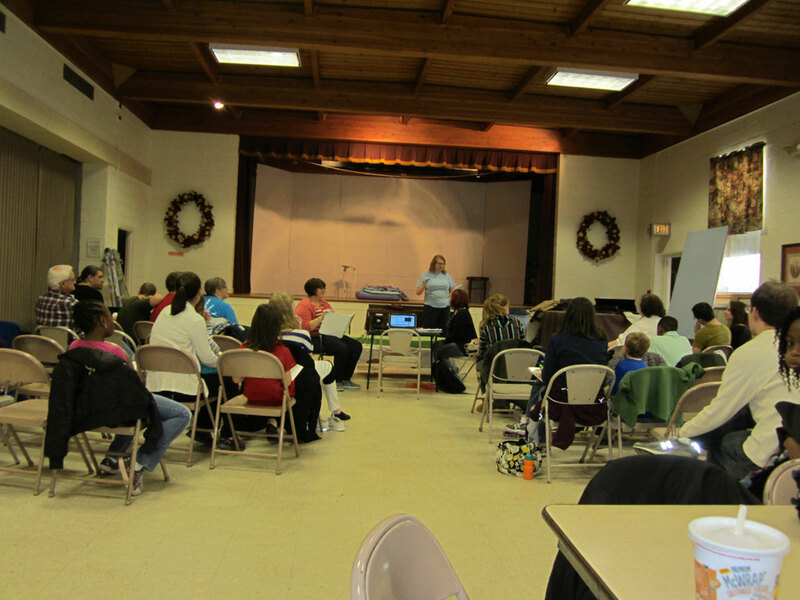 Yesterday Laura and I drove to Glyndon, MD to attend a rehearsal of The Santa Diaries – an hour and a half drive from Easton. We arrived a little before the time rehearsal was to start (one o’clock) but the parking lot already had cars in it. Inside we saw why. 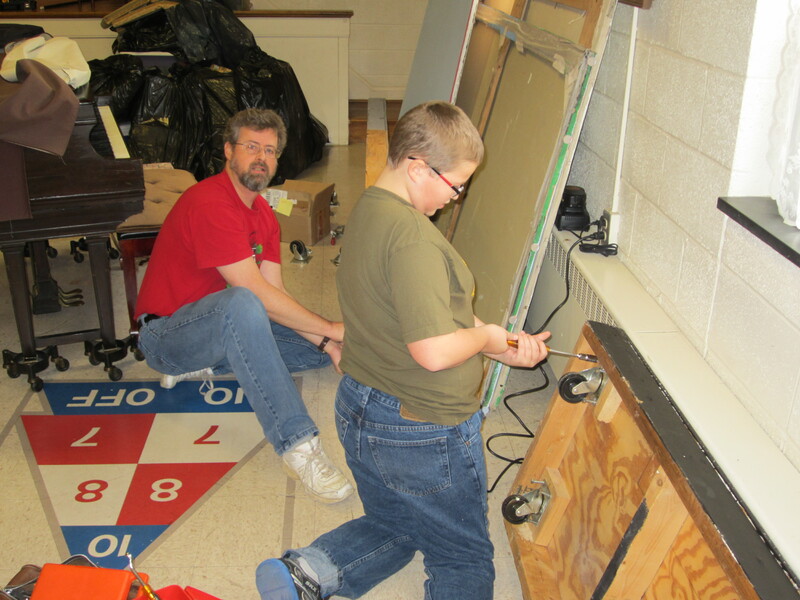 Dan Lohrfink and his son, Philip, were busy screwing casters to platforms that will carry sets. I recognized them from the photos I’d used on the blog about the Lohrfink family. 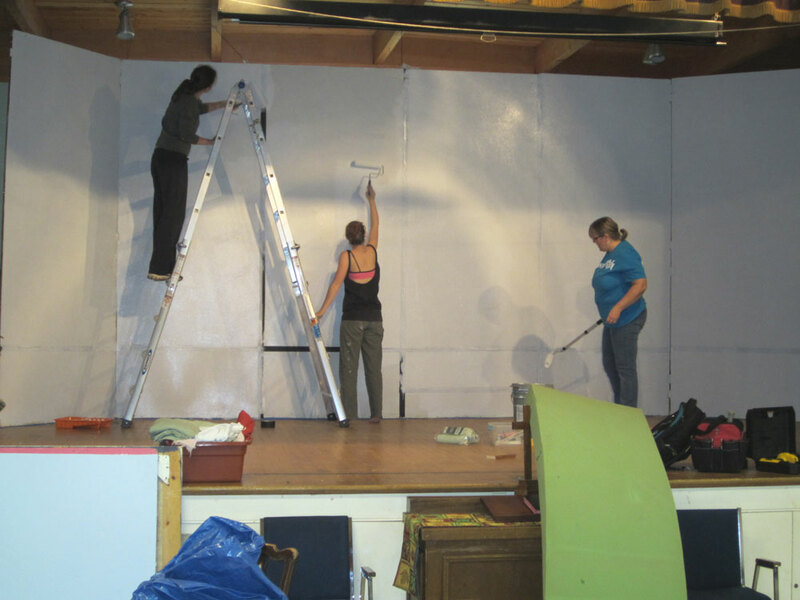 On the stage, ladies were on ladders painting. I recognized some of them as well. The participants in this show don’t just show up and say their lines. They are helping with everything. Somebody even brought in pizzas and soft drinks. Sustenance is really important when you’re putting on a play. We were impressed at how organized the Liberty Showcase Theatre people are. 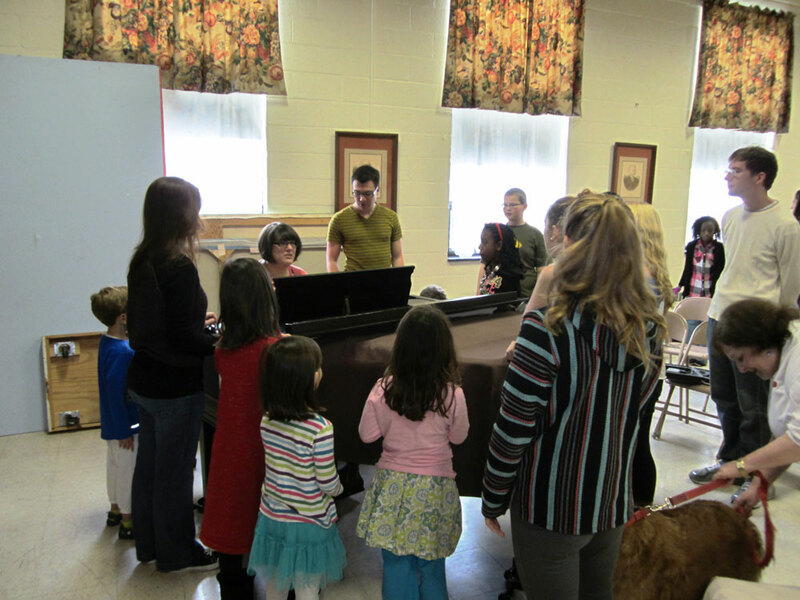 Promptly at one o’clock the music directory, Liz Kanner, gathered people around the piano and began a vocal warm-up. Then they went all the way through Act 1. Seriously…all the way through. There were a few hiccups, but opening night is two weeks away. Plenty of time for tweaking. At the end of Act 1, the director, Barb Gasper, sat everyone down and gave notes – praise where due and suggestions, blocking issues and reminders to everybody about not clomping up and down the stairs to get on stage. There was a ten minute break and the cast went all the way through Act 11, followed by more notes from the director. Because there still was a little time left before the scheduled end time at 4pm, the director asked for a run through of one particular scene. 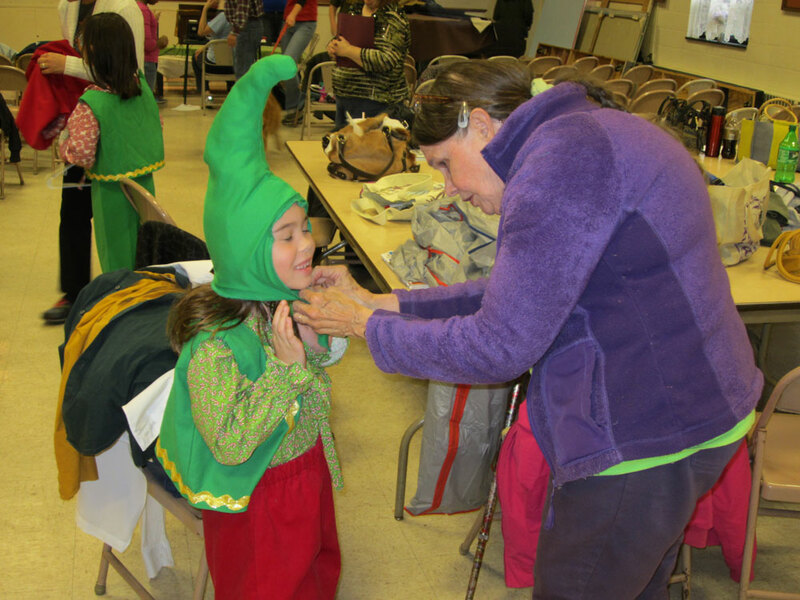 While that was going on children were being fitted into elf costumes by the costumer. We couldn’t get over how well behaved and professional these kids were. They knew their lines, where they were supposed to be on stage and we didn’t see any drama. 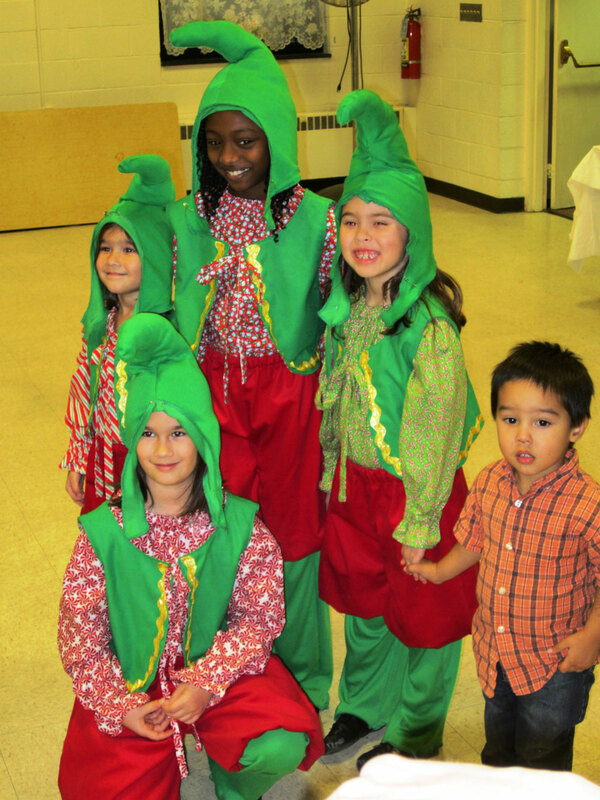 You’d have to be a real Grinch to resist these cuties. It’s just two weeks to the opening and according to Lori Chapman, Assistant Director, everything is on schedule. They’ll hang the lights on Black Friday and the final week will be all tech. She told us there would be two complete dress rehearsals. Laura will be there opening night, Friday, December 6th at 8PM. I’ll go the next day. We are over the moon that The Santa Diaries lives on. Other show times are as follows: Friday, December 13th at 8PM; Saturday, December 7th at 2PM and 8PM; Saturday, December 14th at 8PM and Sunday, December 15th at 2PM. The venue is Glyndon United Methodist Church, 4713 Butler Road, Glyndon, MD 21071.